That’s okay, peeps, I didn’t have a clue until I started blogging in 2008 that there were all kinds of social media outlets I’d never heard of. A curious paralegal has to start somewhere. What is a podcast? According to Dictionary.com, it’s “a digital audio or video file or recording, usually part of a themed series, that can be downloaded from a Web site to a media player or a computer.” In simple terms, you can listen to that recording from any computer, or download it to your fave MP3 player. It’s free, and you can listen whenever it suits your schedule. Many of our listeners tell me they listen on their work commutes. If you haven’t listened to any of Legal Talk Network’s podcasts, you’re missing tons of free legal technology, news, and practice information. But if you’re just getting started on The Paralegal Voice monthly podcast, I’m going to share my 10 favorites so far (not in any particular order). I learn as much from each podcast as our listeners do..
A Fun Dose of Paralegal Ethics ~ Lawyer/humorist Sean Carter is so entertaining that it was hard to end this podcast. Paralegal Resume 101: How to Stand Out from the Competition ~ You know Vicki and I enjoyed the opportunity to share our favorite resume tips (and pet peeves). What Paralegals Need to Know about “The Cloud” ~ During my recent technology and ethics CLE presentations, I still get asked what The Cloud is. It’s a very good question, and Tom Mighell, renowned legal technology expert, answers it here. Talking Murder and Mayhem with Sue Ann Jaffarian: Paralegal & Fiction Writer ~ The delightful author of the best-selling Odelia Gray mysteries featuring a paralegal sleuth talks writing and weight prejudice. Digital Evidence for Paralegals ~ If I was 18 and picking a college major again, it would be forensics, so I found guest Giovanni Masucci, a digital forensic examiner, to be especially fascinating. Erin Brockovich: An Inspiration to the Paralegal World ~ Erin is such a proponent of the paralegal profession, I swear I heard the theme from the Rocky movies in my head at the end of this podcast and was ready to go out and conquer the world! The Virtual Paralegal ~ This field is growing, and we talked to one of the most successful virtual paralegals in the business. 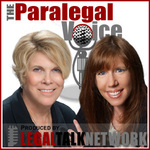 Today’s Paralegals: Career Advice, Ethics Tips & More ~ Former paralegal, current attorney and management consultant, Nancy Byerly Jones, was a lively and informative guest. Practice Management and Ethics Issues… ~ Attorney Beverly Michaelis, one of my favorite tweeting and blogging practice management advisers, helps paralegals avoid common ethics pitfalls. All of our guests to date have been experts in their field, and extremely generous with their time and knowledge, so it was hard to pick a top 10. It’s been an honor to get to chat with them, and I hope you enjoy them as much as I did.